NASHVILLE, Tenn. – The Winnipeg Jets only got a few hours to celebrate the biggest victory in franchise history. The Jets finished off the Presidents’ Trophy-winning Nashville Predators 5-1 in Game 7 of their second-round series Thursday night, then quickly headed home to prepare for the opener of their first ever Western Conference final Saturday night. The Jets will be hosting the upstart Vegas Golden Knights in a conference final nobody predicted. Upstart Winnipeg was swept in its only previous playoff appearance since leaving Atlanta for Canada in 2011. The Golden Knights, meanwhile, are dragging their debut season deep into the NHL calendar. Stastny had one of two Winnipeg goals 2:06 apart in the first period to chase Vezina Trophy finalist Pekka Rinne for the third and final time in their series. Stastny finished with two goals and an assist, and Mark Scheifele finished with two goals, giving him a postseason record seven road goals in a single series . Tyler Myers also scored. Wheeler and rookie Kyle Connor each added two assists, and Jets goalie Connor Hellebuyck, who improved to 4-0 coming off a loss this postseason, made 36 saves to outduel Rinne in the showdown between Vezina Trophy finalists. 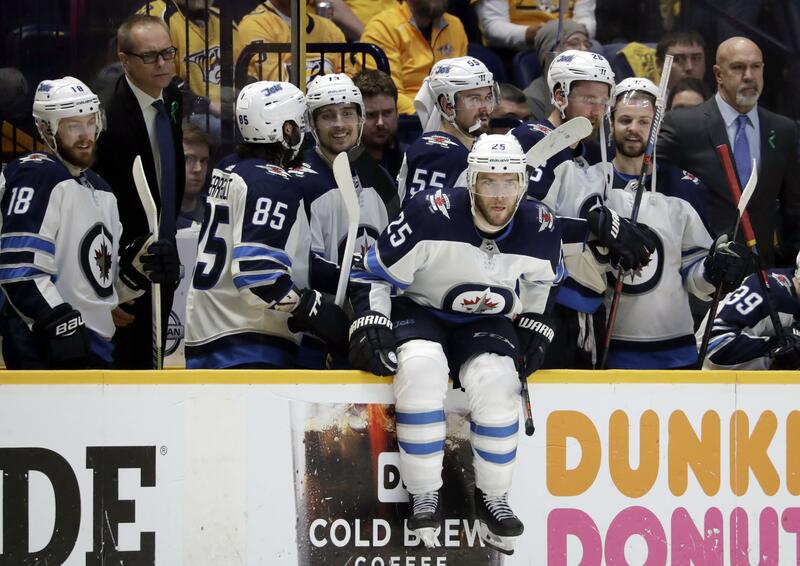 This was the first Game 7 for the Winnipeg/Atlanta franchise, and the Jets dominated the Predators to win in Nashville for the third time in the series. They outskated the Predators and kept the puck on their sticks much of the game, even as Nashville outshot them 21-7 in the third period. By the time Scheifele scored his record-setting goal into an empty net with 2:33 left, the Jets had left no doubt this was their series. Now they head back to Winnipeg, where the Jets posted the NHL’s best home record in the regular season. They have a good idea how much this next series means as Canada’s last team still standing and even more special for Winnipeg after the town lost its first NHL team to Arizona. Published: May 11, 2018, 8 a.m.